Enjoy caramel apple goodness whenever the mood strikes with Caramel Apple Pops, the perfect combination of tart, green apple candy coated with rich, creamy, caramel—all packed into a delicious lollipop all year round. Also available seasonally, assorted Apple Orchard Flavors: Golden Delicious and Red Macintosh. 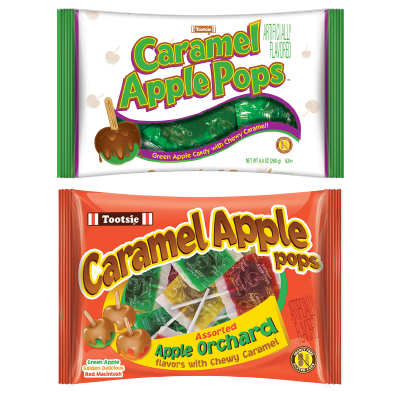 Since their introduction in 1995, they’ve been year-round favorites for caramel apple lovers of all ages. 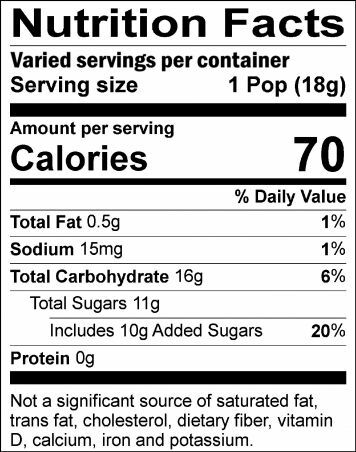 Green Apple Ingredients: Corn Syrup, Sugar, Palm Oil, Dry Whole Milk, Malic Acid, Whey, Artificial Flavors, Salt, Turmeric Coloring, Soy Lecithin, Artificial Colors (including FD&C Blue 1, FD&C Red 40).